Valiant’s Livewire writer is coming to Royal. We’re very excited to announce that we’ll be having Vita Ayala at our shop this month. Ayala will be appearing on Wednesday, April 24th from 5 to 8 pm. Aside from Valiant’s Livewire, we also have a select amount of some of their past books including Batman Beyond, Suicide Squad, and Marvel Knights. 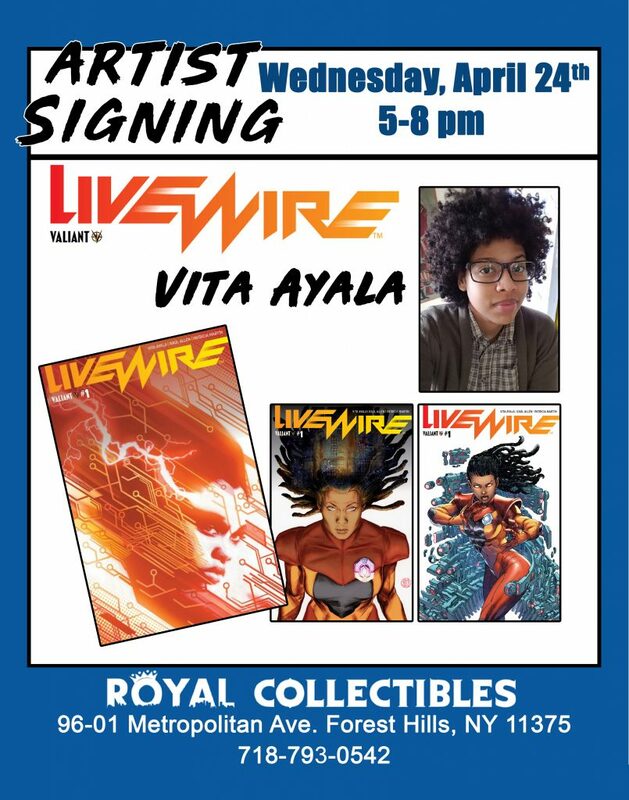 We hope to see you soon at your friendly neighborhood comic shop and please come out to support one of the most important voices in the industry right now, Vita Ayala! Vita Ayala could be found on Instagram and Twitter. This entry was posted in General Info and tagged Livewire, Valiant, Valiant Livewire, Vita Ayala on April 4, 2019 by admin.